If you are looking to visit UAE, be sure to experience the adventurous activities of the deserts in Dubai. 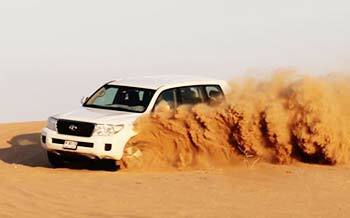 The only way to maximize your thrills and enjoy your Desert Safari Dubai completely during your excursions is with us. Evening desert safaris place you in direct contact with the mysterious beauty of the dusk. 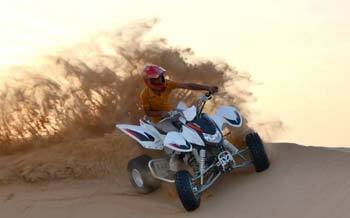 The only time a person becomes a perfect meanderer is when he or she is on a desert quad biking in Dubai. Though the deserts appear calm and motionless, the desert safari activities offered by DesertSafariDubai.ae breathe life in Dubai's golden sands. The pulsating quad bikes, dune buggies, overnight desert safaris or the 4x4 desert safari in Dubai are unbelievable activities to try out and are sure to send quivers down your spine. The rates at which we offer all our desert safari packages to our tourists and our locals are very competitive and highly economical as well. Our desert safaris in Dubai, spell themselves as a paradise irrespective of eras and times not only because of the kind of desert activities we provide, but also because of the piquant delicacies provided by us that cannot be relished elsewhere.